Being found half way through the Vulcan lineup, the Kawasaki Vulcan 900 demonstrates it enjoys being caught in the middle. 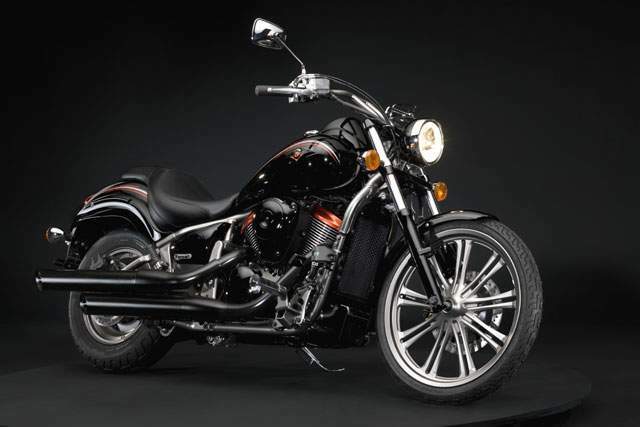 Proof of this fact is the bike’s clean lines inspired from the Kawasaki Vulcan 2000 and the mid-size agility which is characteristic for these kinds of motorcycles. Like you’ve already gotten used to, 900s offer awesome roll-on acceleration with the help of good power and torque, but when these bikes receive their credit by featuring “big bike” looks that is when you know you have a successful product. This is also the case with this Kawasaki. The Vulcan 900 isn’t a long-standing model in Kawasaki’s history but I do know it is one hell of a bike. Introduced in 2006, this mid-size cruiser was the first in Kawasaki’s lineup to ever feature a belt drive and a fuel injection system. These two features practically set it as a customer’s favorite from the first day it started being produced. Also, the 900cc motor was appreciated by the motorcycle press for being a jewel and a great performer also, as the innovations clearly did their job. Being good looking, awesome performing and marking a new beginning at Kawasakis, the Vulcan 900 remained unchanged but willing to further enjoy its success. It does just that as a 2008 model year. The closest competitor for the subject of this review is the Suzuki Boulevard C50, a bike built by the same recipe and featuring almost the same success as the Kawasaki Vulcan 900. The bike features classic lines and a torque 50 cubic inch V-twin so it delivers strong low-end and mid-range torque for strong acceleration, just like the Kawasaki. Honda’s alternative to the 900cc Vulcan is the Shadow Aero, a cruiser featuring full-sized looks and 750cc performance with the advantage of being cheaper than the Kawasaki. Honda aims at success by delivering a cruiser featuring a long and low chassis covered with retro-styled bodywork. As the Vulcan, the other most important feature is its engine, in this case a 750cc liquid-cooled 52-degree carbureted V-twin ready to be put to the test against the fuel injected V-twin found on the Kawasaki. The Yamaha V Star Classic doesn’t quite dispose of a 900cc motor, but it is still a middleweight cruiser so it is suitable for the fight against the bikes I’ve just talked about. More important, it features belt final drive, so it is well worth mentioning it in this heading. First, the Kawasaki Vulcan catches its future rider’s eyes with clean classic lines which are inspired from its bigger siblings and it then uses the comfortable ergonomics in order to get him completely. 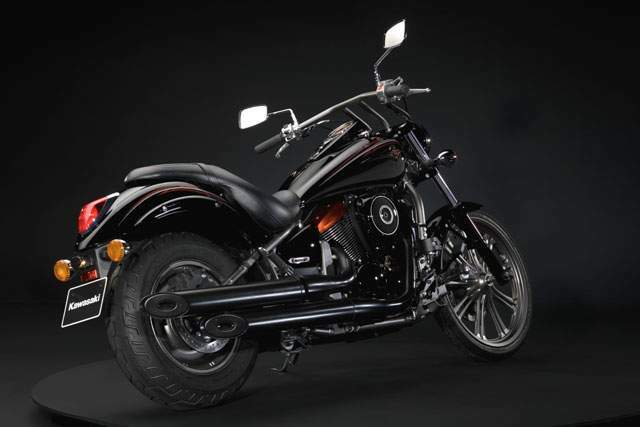 We all know that we like mid-size bikes to look bigger, more powerful and implicit more able, and that is what the Kawasaki Vulcan 900 Classic does. The bike gets its classic cruiser curves from its valanced fenders and nicely shaped fuel tank but what really speaks for itself is the chrome found all over this bike. On the headlight cover and the air cleaner, on the exhaust and signal lights cover, or on the rear fender ornaments, Kawasaki knows that it will have the needed effect. The spoked wheels accentuate the old-bike look but what I appreciate most are the wide, pullback handlebars found on this thing. If you are already thinking on picking a color, you will be glad to find out that it can be painted Ebony, Metallic Titanium, Candy Caribbean Red, or Candy Caribbean Blue. With so many colors available, it makes sure to look awesome both on the boulevard and down the highway. To understand where Kawasaki's new for 2007 Vulcan 900 Custom fits in the Vulcan family, read through Teri Conrad's article on the Vulcan 900 Classic, the sister to the Custom. The Custom is the sporty, custom version of the Classic. Genevieve shows off the aggressive, sporty ride of the 900 Vulcan Custom. The best way to experience the Custom's finer points is to ride the Classic first, which I did. The Custom feels sleeker and lighter and rides much more deliberately – just like a sportbike going right where you point it. I really like the Custom. Where the Classic lumbers through the turns, the Custom really carves them up. Genevieve demonstrates the 27-inch seat height. She stands 5 feet 6.5 inches and is wearing two-inch heels. Her inseam is 30 inches. The seat height is slightly higher than the Classic at 27 inches, but still relatively low for a cruiser. The bike and seat are not too wide, so you don't lose leg inches in the spread. The riding position has your feet reaching forward to meet the footpegs and foot controls; arms are outstretched to meet the flat, drag style handlebars. The ergonomics remind me of a custom Pro Street -- to borrow terminology from the custom bike world -- sleek and long with a low profile. The new 903cc Vulcan engine on the Custom is the same one described in our review of the Vulcan 900 Classic. Engineers started with the Vulcan 800 engine making significant improvements, including eliminating the carburetor in favor of fuel injection. The fuel injection is the same system developed for the Vulcan 2000 motorcycle, including the "automatic fast idle system" that makes for easy starts in cold weather. High energy ignition coils like the ones on the Vulcan 2000 provide a hotter spark at low rpms. This produces a consistent output of power at any speed. The front tire is stretched around a custom cast wheel with designer styling. Arranged in pairs, the 18 "spokes" are hand-designed. This striking accent is one of the bike's finer points, in our opinion. The Custom also has that "big bike" look Teri writes about with the Classic, but comes in a manageable middleweight package – ideal for very confident beginners and intermediate riders. Styling and ergonomics are where the bikes differ. The Custom has a 21-inch wheel versus the 16-inch on the Classic. The skinnier 80mm tire wrapped around it-- common on custom motorcycles -- contributes partly to the Custom's different ride. Less rubber up front gives you the feeling you can whip the bike around more easily, which you can. Keeping you planted throughout the ride is the big 180mm tire in the rear wrapped around a 15-inch rim, the same set up as on the Classic. The fenders on the Custom are shorter than the Classic's to expose more of the tires. In addition to the shorter fenders on the Custom, the passenger section of the seat is shorter. The Custom's saddle is what's called a gunfighter style, a solo seat that narrows as it extends to the rear, only really good for quickie passenger accommodations. I say quickie because, passengers will find they won't be able to spend too much time on this narrow strip of flat-cushioned rubber. If regular riding plans include a passenger, opt for a saddle with better back seat accommodations. I had a great time riding the Custom. It zipped along feeling much lighter and quicker than the Classic. I also felt more power on roll-on coming off the line than with the Classic. This could be attributed to the lighter weight of the bike as the engine is virtually the same. The Custom weighs only eight pounds lighter than the Classic's 549 pounds, but it skirts along like it's much more lighter than that. I can't say enough about much fun I had with this bike. The drag-style handlebars on the Custom with integrated risers that bring the bars up toward the rider. I found the brakes did a good job at stopping me when and where I wanted to, A large 300mm disc in the front, and a 270mm disc in the rear are slowed by twin-piston calipers. If you like the ergonomics, ride, and styling of this minimalist bike more than the Classic or Classic LT, Kawasaki offers a lot of accessories to outfit the Custom for touring. Two different size windshields are available as well as a luggage rack, saddlebags, a lightbar, and a backrest if you decide to take a passenger. Don't forget to spring for a better passenger seat first, though.